Odyssey is a place of wonder, excitement and discovery where adventure is always waiting around the next corder. Come inside and be whisked away to family fun, great moments in history, intriguing mysteries and laugh-out-loud comedies. 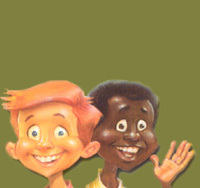 Along with Whit and the gang, you‘ll learn about courage, faith, doing what‘s right and finding the adventure in everyday life. 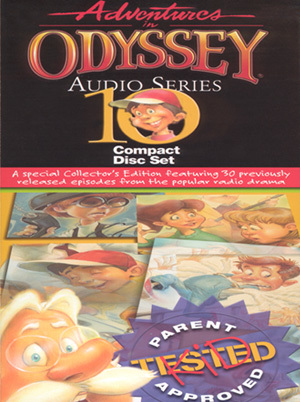 Adventures in Odyssey features top-notch audio production, film-quality sound effects and music, and top-name voice talent. The result is a groundbreaking hit radio series that has entertained families for over 15 years. The thirty episodes inside this special collector‘s edition are perfect family entertainment for your home, in the car - or wherever you are! Whit creates an Imagination Station program that shows the user a glimpse of life after death. The program shows Whit a heaven from which he might not want to come back, while it gives Eugene a taste of hell which terrifies him to no end. Jimmy tries out a new invention of Whit's, the Room of Consequence. By using it, he is able to see the possible results of his actions. Just wait until you see the "new" Bernard Walton! you won't believe it! The wackiness begins with Bart Rathbone's dastardly plan to steal away Bernard's customers. Bernard then decides to improve his "image." And who better to help him than Edwin Blackgaard? Lawrence claims to have seen Harlow Doyle kidnapped by a band of bootleggers! Whit is willing to give him the benefit of the doubt, despite his wild imagination, and find out what happened. The jury's still out and the verdict may surprise you! When Eugene and Bernard end up serving jury duty together, will a disagreement over the case ruin their friendship? And what about the "hidden" facts of the trial?